Reason for Reading: Hoping for some of the humour in Evanvich’s Stephanie Plum series. Why you should read this book: This is Evanovich’s first book, re-written and re-released, presumably with some of her trademark spark, and we do catch glimpses of that in Billie, and Deedee’s crazy antics – she’s engaged to a wrestler, Frankie The Assassin, and is determined to set up Billie with a wrestler of her very own. In the last hundred or so pages, the story takes a more suspenseful, Stephanie Plum-like turn, adding to this otherwise straight romance novel. Why you should avoid this book: If you’re reading this book, it’s because you’re a fan of Evanovich’s Stephanie Plum series. But really, it’s not worth the effort. 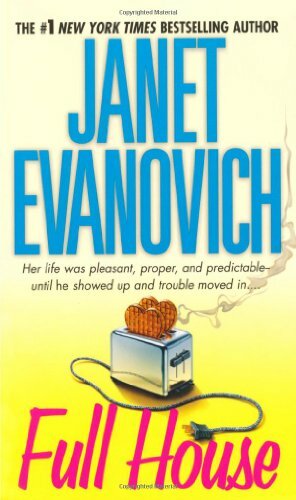 Most of the book is a straight romance novel, which isn’t a problem in itself, but Evanovich shows little of her gifts for pacing and tension, leaving the reader reading boring page after page of Billie pondering why a handsome man might want a single mother. The only drama in the book comes at the end, and even that feels tacked on in an effort to placate Plum fans. Nicolas Kaharchek surveyed his seven new polo students moving across the sandy practice field. He grinned as he watched an especially entertaining female named Billie Pearce. ‘Lunch,’ Billie said, staring at her new engagement ring. It was beautiful. It was absolutely perfect. And the sight of it made her stomach upset. Instead, try: Fly-Fishing by Sarah Harvey; Lola Carlyle Reveals All by Rachel Gibson; Divas Las Vegas by Belinda Jones. Also by this author: Motor Mouth; Metro Girl; Hot Stuff; Plum Lovin’; Lean Mean Thirteen; Twelve Sharp; Eleven on Top; Ten Big Ones; To the Nines; Visions of Sugar Plums; Hard Eight; Seven Up; Hot Six; High Five; Four to Score; Three to Get Deadly; Two for the Dough; One for the Money; Full Scoop; Full Tilt; Full Blast; Full Speed; Full Bloom; How I Write; Back to the Bedroom; The Rocky Road to Romance; Love Overboard.